I exhibited one of my paintings as part of a larger group exhibit with the South West Society of Botanical Artists (SWSBA). The theme is 'Lost plant names from the oxford Junior Dictionary' inspired by charity Plantlife's Forget-me-not campaign which aims to highlight the plant names left out of an edition of the children's dictionary. Simple plant names such as 'conker' and 'dandelion' are left out and replaced by 'broadband' and 'cut and paste'. 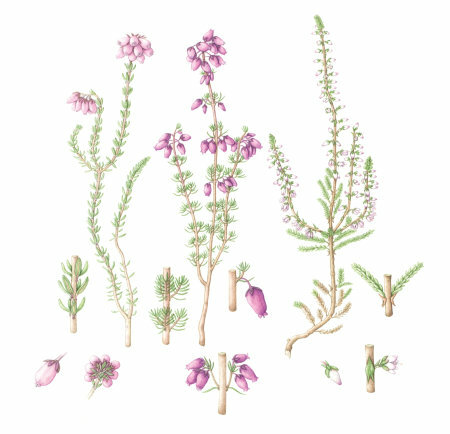 I have illustrated the plant name: heather. I show three different types of heather that can be found on Dartmoor- bell heather, ling and cross-leaved heath. The exhibition was very well received and SWSBA was awarded a silver medal.